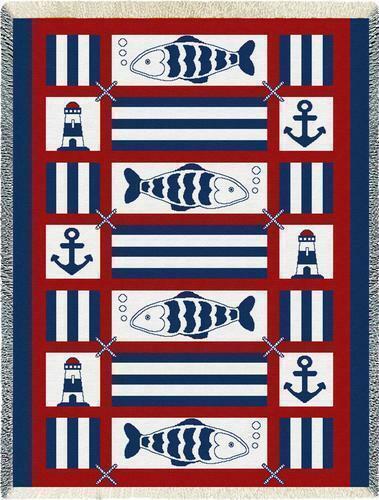 "Nautical Fish Tapestry Throw" This tapestry throw features a red, white, and blue nautical motif of fish, anchors, and lighthouses in crisp vibrant colors. Perfect for the coastal lifestyle. Makes a great gift! Cotton. Machine washable, gentle cycle, cold water. Tumble dry on low heat. Measures 48" Wide x 69" Long. PLEASE NOTE: Shipping ONLY within the continental U.S. **Hawaii, Alaska, and Puerto Rico must contact seller for shipping quote before ordering.